The New Zealand cricket team have always played well in the ICC Tournaments irrespective of their form leading up to it. The Black Caps lost to Australia in the last World Cup final but not before uniting an entire nation in support of the cricket team in a land where rugby is the premier sport. They will be confident of a good showing in England under the management of Gary Stead. Team selection will be crucial for the Kiwis like every team and the selection committee would not want to mess up anything. Let us look at the pool of 30 players from which the final New Zealand squad is likely to come up. ICC Cricket World Cup 2019 Schedule in PDF: Ticket Prices, Dates, Venue Details & Timetable Available for Download Online. Kane Williamson: The Black Caps skipper is probably their best batsman in all forms of the game. A very calm headed guy on the field, Williamson will need to marshal his troops well in England for them to lift the Cup. Colin Munro: Left-handed Colin Munro can be a destructive top-order batsman who will likely open the innings throughout the World Cup for New Zealand. Martin Guptill: He has featured in two World Cups for the Kiwis and the 32-year-old experienced opener will be on the flight to England given the wealth of talent he possesses. Henry Nicholls: He opened the innings along with Munro in the recently held series against India and although things did not pan out well, he is in contention. Ross Taylor: Ross Taylor is the backbone of the side and he binds the middle order and the lower order together. He has the experience of playing in big games which will come in handy at the 2019 World Cup. George Worker: Central Districts batsman George Worker averaged a decent 33 in the 8 ODI games he played for his country and could be picked as a middle order batsman. Daryl Mitchell: Daryl Mitchell boasts of a good average in domestic cricket with the bat and while he is yet to play an ODI game for the Black Caps, he is in the probable 30. England Squad for ICC Cricket World Cup 2019: Here’s a Look at English Team’s Expected 30-Man Players List for the Mega Event. Tom Bruce: Tom Bruce has been getting his chances with the T20 squad but he has spoken of his desire to play ODI cricket for his country. Tom Latham: Tom Latham is a batsman who can also keep wickets which enables the Kiwis to field an extra batsman in the team. He is quite consistent with his batting and integral to the team. BJ Watling: He is a pure wicket-keeper batsman who is more of an option in Tests but has also represented the Kiwis in ODI. He can be accommodated as the extra wicket-keeper in the squad if the management decides. Tim Seifert: The third wicket-keeping option for New Zealand, he has started getting picked in the T20 and ODI squads recently and could well be the shock name in the squad. Corey Anderson: The New Zealand selectors have confirmed there is still a place in the team for Corey Anderson if he gets back to his usual best which is good news for the player. James Neesham: He came back in the India series recently and looks likely to be picked for the World Cup if he remains fit and in form. Colin De Grandhomme: The most likely pick for the all-rounder spot in the team, Grandhomme is a match winner who can be very dangerous with both bat and ball. Anaru Kitchen: Veteran all-rounder Anaru Kitchen may not make it to the final squad but the selectors will have an eye on him in the build-up to the World Cup. ICC Cricket World Cup 2019 Warm-Up Matches Schedule: Check India’s Fixture Dates Against New Zealand and Bangladesh. Mark Chapman: Honk Kong born Mark Chapman did get his chances in 2018 with the national team and has a hundred to his name too. He can make his case for selection in the World Cup-bound team. Ish Sodhi: Ish Sodhi has been one of the premium spinners for the Kiwis and will be a part of the final setup. He may not like bowling in the fast pitches of England but his variations could benefit New Zealand. 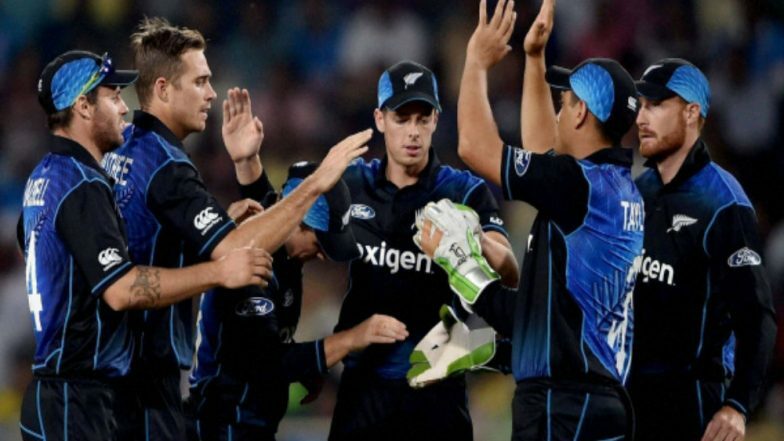 Mitchell Santner: Another top spinner particularly in the shorter format of the game, Santner is a wicket-taking option for his skipper, particularly in the first twenty overs. Ajaz Patel: New Zealand may not opt for a third spinner in the squad which means Ajaz Patel is more of a cover. Tim Southee: The experienced Tim Southee has played in the World Cup twice and this could well be his last chance to win the event. Blair Tickner: He has performed decently in the domestic cricket back home but that may not be enough to clinch a place. Scott Kuggeleijn: He has recently been given chances with the Black Caps after a few off-field controversies. The fast bowler has probably run out of time to impress the coaches though. Doug Bracewell: Dough Bracewell is likely to be picked considering his medium pacers are well suited for the English conditions. Adam Milne: All is not lost for Adam Milne as he has been assured of consideration by the selectors when they sit down to pick the final team. Lockie Ferguson: KKR pacer Lockie Ferguson is a real talent with the bowl and averages well in ODI cricket. He also has a strong chance of making it to the World Cup. Neil Wagner: Wagner is more suited to the test game but could be used a cover in case of an injury to a premium bowler. Pakistan Squad for ICC Cricket World Cup 2019: Here’s a Look at PAK Team’s Expected 30-Man Players List for the Mega Event in England. Trent Boult: New Zealand’s best bowler who is a threat to the opposition in any condition is one of the first names to be picked in the playing eleven. Todd Astle: More of a bowling all-rounder, his capabilities with the bat saw him getting picked over Ajaz Patel and he is certainly part of the probable 30. Matt Henry: His stint with Kent in County Cricket may tempt the selectors to pick him since he plays the majority of his cricket in England. New Zealand have a good squad and it would be a major surprise if they fail to make at least the semi-final in the 2019 World Cup.